Welcome to another segment of “What works for me.” Today I began to prime some of my substrates for the upcoming weekend of pouring to my heart’s content, when it occurred to me that some folks might not gesso their canvases, and might find out down the road (like I did) that they wished they had. So, buckle up, here we go. I’ll walk you through how to prep canvases for pouring. Most, if not all, store-bought canvases state that they are gesso-primed. While this might be true, I still find the need to gesso them again at home before I pour. Basically, that means that the acrylic paint needs assistance to grip the canvas and leave a stain. This is especially necessary for us pourers, because we’re typically adding pouring medium and a silicone product, whether it’s treadmill oil, WD-40, or, my personal favorite, K-Y True Feel. Our mixtures need all the help they can get to do what we want them to do. When I’ve chosen to pour onto a canvas that I haven’t gessoed, I’m never happy with the outcome. The edges don’t get covered properly and the canvas shows through the paint. Ugh. Planner that I am, I like to prime a lot of canvases at one time so that I only need to bring out my gesso occasionally. I get them done in batches and my canvases are primed and ready for me to use whenever I choose to pour. To start, I set up my bathroom cups on my desk and ensure that I’ve got a sufficient quantity for the amount of canvases I plan to prime. My personal method of pouring is to do certain tasks all at once on one day. For example, I may varnish 10 paintings at a time. Same applies to removing skins from my container lids, photographing, or moving paintings from my drying rack to my curing rack. This method may work for you, or it might not. I have a lot more space than others, so I know this might be difficult for some. Select a large variety of sizes of canvases to prime. 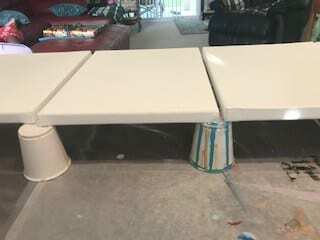 Prepare your drying surface by setting up your cups to hold the canvas once ready. Pour your gesso into a dish of some sort. Get a nice size brush with firm bristles. My personal favorite is a Grumbacher wash brush that I found. It does a great job. Put on an apron and gloves. This stuff gets everywhere! Paint the gesso onto your canvas with lots of “X X X” strokes, similar to what you would do when painting a wall at home to ensure you cover every groove and crevice. Without putting more gesso on your brush, make clean straight strokes, both vertical and horizontal. Be sure to paint the sides and edges of your canvas. This is the primary area where your paint will otherwise spread out and allow canvas to show through. Make sure you are using a very thin amount of gesso to accomplish the aforementioned steps. Place your canvas on the cups to dry. Allow to sit for half a day minimum. I typically allow 24 hours. 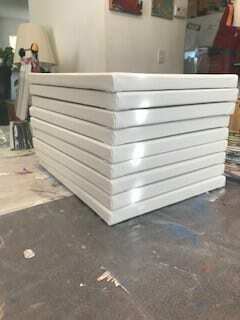 Stack canvases in a clean area, preferably covered with a cloth of some type to keep them clean and dust free until you need them. I have occasionally purchased a painting from a thrift store for the purposes of painting over it. In this case, you definitely need to gesso it. These paintings may require more than one coat of gesso, because you don’t know if the painting was done in acrylic or oil, or maybe even watercolor. I’ve even had some canvases that were suspect and I didn’t want any critters in my home, so I left them outside for a day or so, then washed them with Dawn dish soap, front and back. Then I let them dry for a couple of days before gessoing them. Additionally, I’ve even resurrected some of my earlier work that I now loathe. I’ll just gesso right over my disaster and start again. Gesso is a GREAT PRODUCT! I hope my little tutorial has helped you. Perhaps it answered a question you had or cleared up something that was confusing. At any rate, I always aspire to share at least one little nugget that you can walk away with to make pouring fun and worth your while. Let me know if you have any questions or share with me your tricks for preparing your canvases or substrates for pouring. 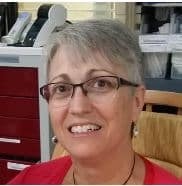 Born in France, Patricia now calls Palm Coast, Florida, home, where she runs Oceans Apart Studios. She’s had the pleasure of raising two daughters and nineteen medical foster children. Now she specializes in watercolor, acrylic pouring, and custom jewelry taken from the run off of her paintings. Her pieces aim to capture the differences that make each woman uniquely beautiful. Check them out on Etsy. 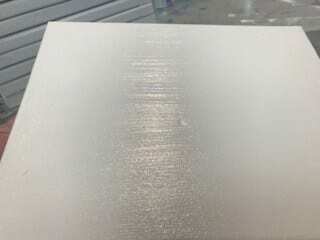 Can I use Liquitex’s Clear Gesso to prime the canvas? 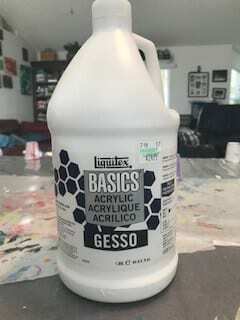 I bought a large bottle of Liquitex gesso and it is so thick I have to squeesse it out of the bottle. Can i thin it witg water or should I take it back? No, don’t thin out, it’s supposed to be like that. 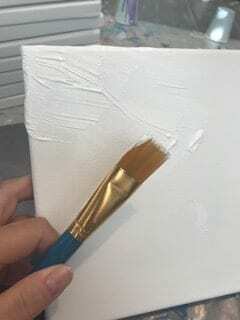 Brush it on your canvas in a very thin layer(go over and over it to get all the nooks and crannies) If you’ve got the patience, let it dry overnight and give it a second thin coat the next day. Good luck!